iOS Data Recovery is an easy-to-use iPhone/iPad/iPod data recovery tool that can help you easily recover photos & videos, contacts, SMS, calls, voice memos, calendars, even App data you thought you'd lost forever. 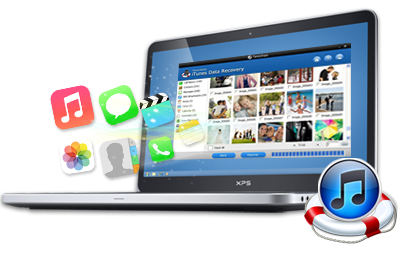 With this powerful data recovery software for iOS, you should no longer worry about losing important data files. It helps you recover deleted data from your iOS devices like iPhone 4, iPhone 3GS, iPad 1, iPod touch 4, or from iTunes and iCloud backup. The world's no.1 iOS data recovery tool to help you recover the valuable iOS data like lost contacts, messages, pictures, notes, etc. that you thought was forever lost. • Recover data directly from iOS Device - Connect your iPhone/iPad/iPod to computer and you can retrieve data or deleted files by directly scanning the iOS devices. 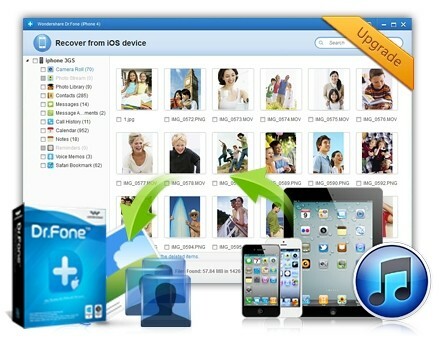 • Recover data from iTunes Backup - Find iTunes backup on your computer by itself and scan the backup for your lost data. • Recover data from iCloud Backup - iCloud backs up your iOS device over Wi-Fi at any time, including contacts, calendars, bookmarks, mail messages, notes, shared photo streams, My Photo Stream, and documents, etc. • For iPhone 4/3GS, iPad 1 and iPod touch 4G - Directly recover 18 types of files including messages, contacts, call history, calendar, notes, WhatsApp conversation, reminders, safari bookmark, App documents, camera roll, photo library, photo stream, message attachments, voice memos, voicemail, WhatsApp attachments, App photos, App videos. • For iPhone 5S/5C/5/4S, iPad 2, New iPad, iPad with Retina Display, iPad Air, iPad Mini, iPad Mini with Retina Display and iPod touch 5G - Directly restore 9 types of data including messages, contacts, call history, calendar, notes, WhatsApp conversation, reminders, safari bookmark, App documents. 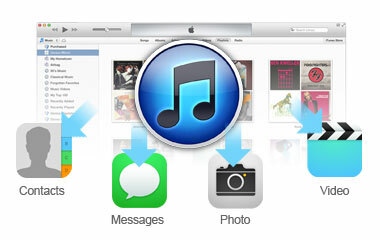 (* If you want to recover the rest types of data, please turn to "Recover from iTunes/iCloud Backup File"). 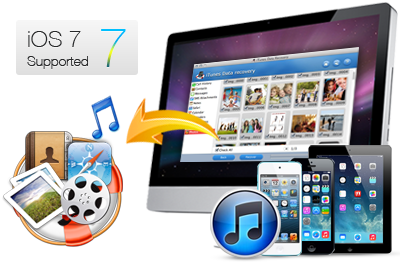 iOS Data Recovery for iPhone/iPad/iPod is able to recover lost files by scanning and extracting previous iTunes/iCloud backup files for iOS device. • Multiple file formats - Recover 12 different types of lost files including contacts, messages, call history, calendar, notes, reminder, Safari bookmark, camera roll, photo stream, voice memos, voicemail, and App data from WhatsApp, Flirc, iPhoto, iMovie, Kindle, Keynote, etc. from your iTunes backup, or from your online iCloud account. • Various causes - The best solution to recover data from a lost iDevice, as well as from the iDevice has been reset to factory settings, failure to upgrade, system crahs, or jailbreak. With the practical iOS data recovery tool, you can recover data from iPhone/iPad/iPod touch easily under various situations, such as iOS upgrade, device loss, jailbreak, etc. 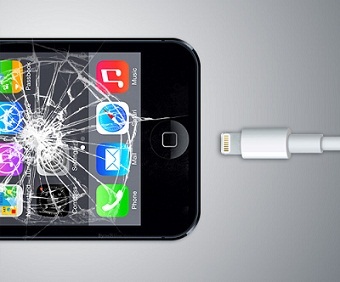 • For iPhone 4/3GS, iPad 1 and iPod touch 4G - Accidently deleted files on your iOS device; your device is crashed, smashed or broken; the device is locked by a forgotten password. User friendly interface and ultra-fast recovery process allow you to selectively recover and save lost or deleted iPhone/iPad/iPod touch files with few clicks. 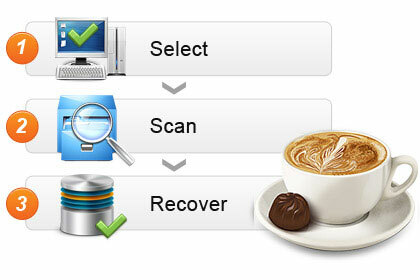 • User friendly interface - Professional design of one program with 3 recovery solutions for all Apple mobile devices. Preview lost files before recovery with organized, clear and original quality before recovery. 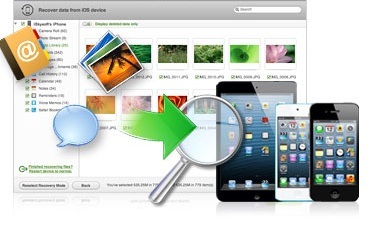 • 3-step recovery process - The data recovery process with use of this professional iPad/iPod/iPhone data recovery program is ultra-fast in 3 steps only: connect, scan and recover. It's the most comprehensive data recovery solution in the market which helps you to recover lost data directly from iOS devices or retrieve backups from iTunes and iCloud in just a few clicks. • As easy as you can imagine - The top-leading recovery processing technology makes it recover data from your iPhone/iPad/iPod touch as easily ad quickly as you can imagine. • Life-long free update - Get frequently upgrade in accordance with iOS upgrade. And you are able to enjoy free softwate upgrade and high level technical support forever.